Can I make a rice pudding with this? It's the Easy Cook type. You can make rice pudding from almost any type of rice, even black & red. However, the texture & consistency will change if you change the rice. If by Easy Cook Type, you mean something similar to our Minute Rice, I suspect the texture may be a little mushy, but it will still be rice pudding. I made rice pudding all the time with Minute Rice (like Silversage, I'm assuming that's what your Easy Cook is) many eons ago, as did my mom and grandma. Turned out just fine. 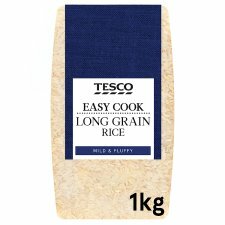 It's Tescos Easy Cook LONG Grain Rice.. I must confess to never having made a rice pudding, but my mother, MiL and wife all used a short grain rice for puddings. The term 'Easy cook' rice amuses me. I mean, cooking rice isn't exactly hard. I expect it really means 'quick cook', but again, I've never found it to be much faster than ordinary rice.